Chosen for their accessibility and variety, the readings in Making Sense of Language: Readings in Culture and Communication, Third Edition, engage students in thinking about the nature of language--arguably the most uniquely human of all our characteristics--and its involvement in every aspect of human society and experience. Instead of taking an ideological stance on specific issues, the text presents a range of theoretical and disciplinary perspectives and bolsters them with pedagogical support, including unit and chapter introductions; critical-thinking, reading, and application questions; suggested further reading; and a comprehensive glossary. 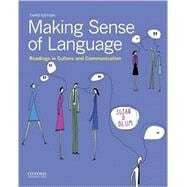 Questions of power, identity, interaction, ideology, and the nature of language and other semiotic systems are woven throughout the third edition of Making Sense of Language, making it an exemplary text for courses in language and culture, linguistic anthropology, sociolinguistics, and four-field anthropology. Susan D. Blum is Professor of Anthropology at the University of Notre Dame. She is the author of several books, including "I Love Learning: I Hate School": An Anthropology of College (2016) and My Word! Plagiarism and College Culture (2009). Unit 1: What Is Language? 7. Stephen C. Levinson, Language and Mind: Let's Get the Issues Straight! 28. William Labov, The Social Stratification of (r) in New York City Department Stores? 33. William M. O'Barr and Bowman K. Atkins, "Women's Language" or "Powerless Language"? *37. Penelope Eckert, Where Does the Social Stop?